This is a big bowl of comfort food and it did not take long at all to make it. 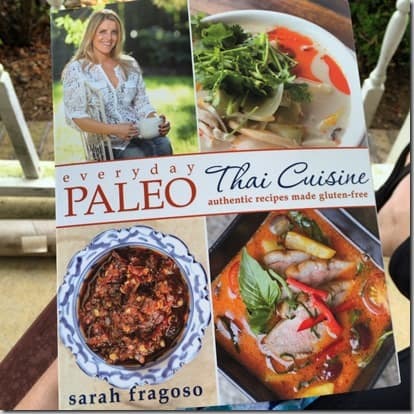 I started with this recipe from Sarah Fragoso’s Everyday Paleo Thai Cuisine which is an unbelievably authentic book with recipes she perfected while traveling around Thailand. I then tweaked it a bit because I wanted a little more heat. My version in no way compares to the real thing in Sarah’s book. I’ve made it both ways and mine is an “Americanized” version which means it won’t knock your socks off like the real thing. The recipe in the book calls for Panaeng curry paste and it truly is much better than the store-bought stuff. However, not everybody has access to the ingredients. I would encourage you to find a good red curry paste that does not have a load of MSG. The mixture of curry paste and coconut milk with the dash of maple at the end is what makes this so good on a cold night. I put mine over rice to make it into leftovers for lunch. 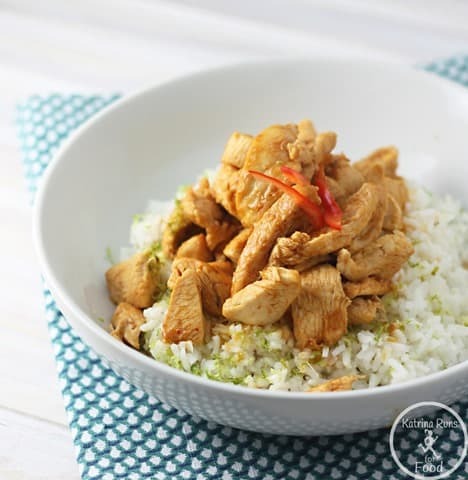 I zested the lime over the rice to give it an extra zing. 1. Heat a large wok on med. high heat. Add oil. Let it melt. Add paste and stir together. 2. Add chicken and cook 6-8 minutes, stirring often. 3. Add coconut milk and let it come to a low simmer. Stir often and cook for 5 more minutes. Add maple syrup. Stir and remove from heat. 4. Add lime juice and lime zest to the rice. Stir. 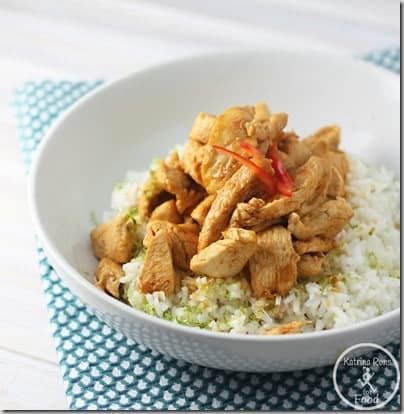 Top with chicken and sauce.